Wikipedia strikes again. Or rather, Wikipedia strikes out again. 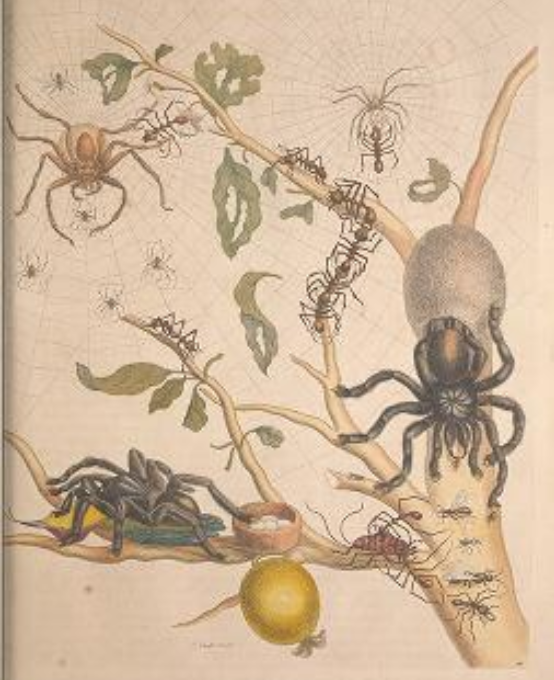 Linnaeus’s name avicularia is derived from the Latin avicula, meaning “little bird,” and refers to a 1705 illustration by Maria Sibylla Merian, showing a tarantula feeding on a bird. What’s worse, though, is that this bit of garble was obviously the direct source for a recent blog entry that credulously repeats the same naive misapprehension. 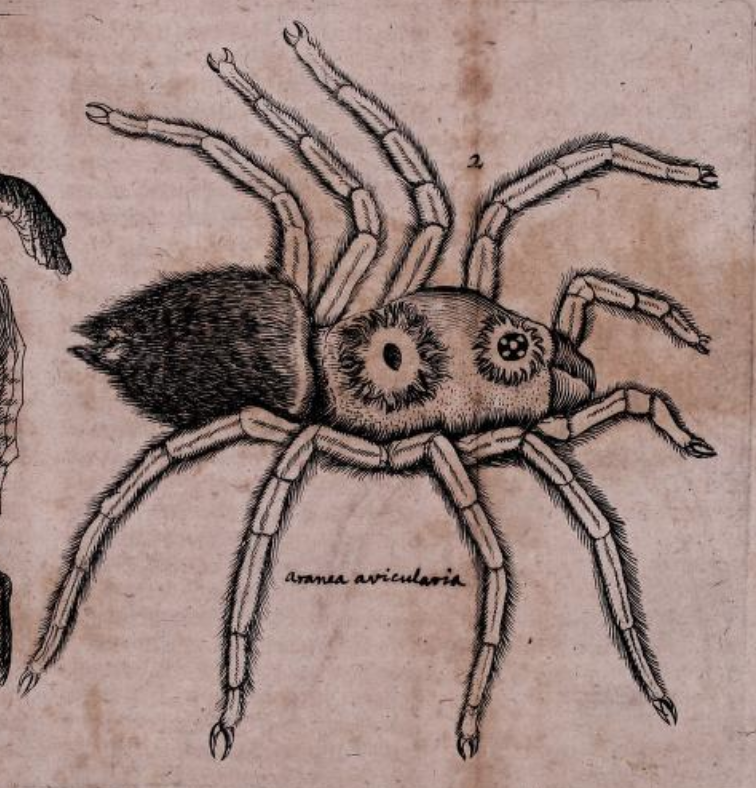 It’s quite true that Merian shows a spider eating a bird, and that the pioneering entomologist identifies that bird as a “Colibritgen,” a hummingbird. 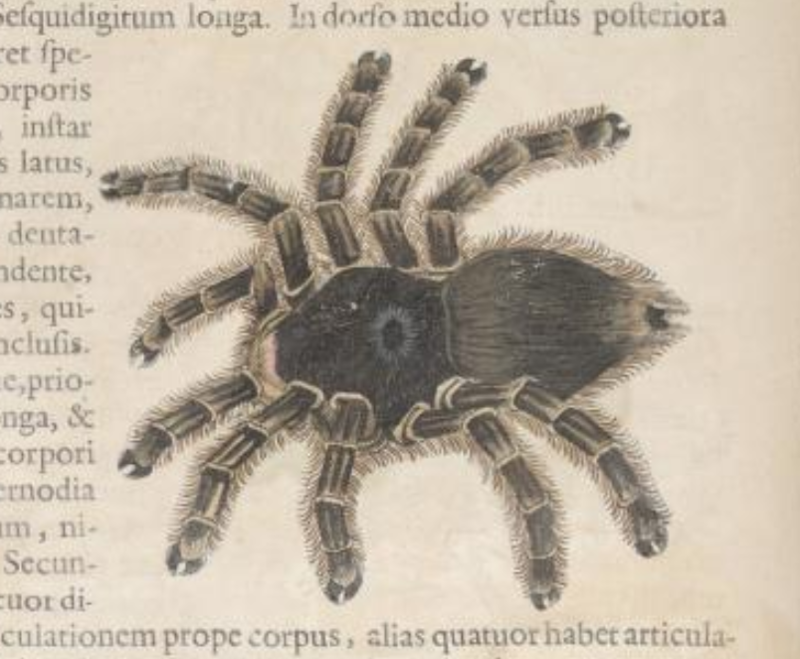 There is no indication in her text, however, that the striking plate “illustrates a real event that she witnessed in Suriname.” And Linnaeus’s inspiration for the name avicularia in fact antedates Merian’s work by some decades. 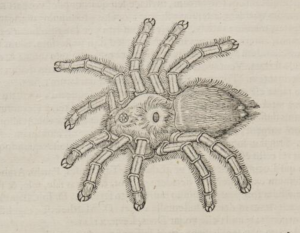 And one of those sources, Adam Olearius’s 1674 catalogue of Duke Frederick III’s Kunstkammer Gottorf Castle in Schlewsig-Holstein, labels its big hairy spider Aranea avicularia. This was twenty-five years before Merian undertook her groundbreaking expedition to the Guyanas, and more than three decades before she published the greatest of all early modern entomologies. All well and good — but what about the behavior behind the spider’s grimly humorous epithet avicularia, “the birdkeeper”? Aren’t her real accomplishments enough without adding fictional deeds to them? Everybody’s interested in birds, even if they might not call themselves a birder. And on returning from lunch I found an e-mail from the Antiques Roadshow asking for the identification of a bird painted by a famous American bird artist. You’ll have to watch the show to find out yourself, but I was able to pass on the bird’s identity–and, with a little e-sniffing around, the year the painting was likely produced. 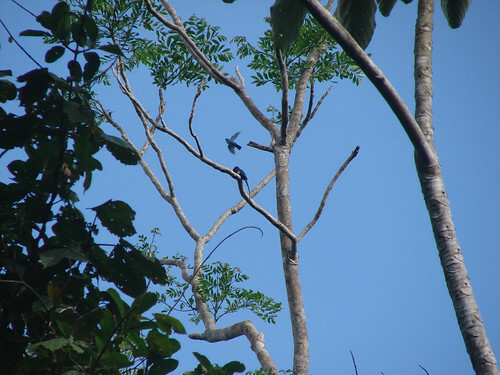 An Amazon Kingfisher suns in Guyana, closely approximating the posture of a limed bird. It’s not quite what I had in mind when I started the “Birds and Art” tours here at WINGS (Provence this year, Tuscany and Provence in 2010, Provence and Portugal in 2011…), but it’s terrific fun! Like anyone else with sense, I love jacamars, and so I lingered over last November’s poor images of Paradise Jacamars when I was moving them to flickr tonight. Quite a bird, as sharp at one end as at the other! One of my photos, though, offered up a surprise–and a mystery. In flagrant violation of Rule 2 for Successful Birding, I was looking at the stupid viewfinder when something flashed across the background. What is it? Is it really blue? I’m at a loss, never having seen a Cotinga cotinga fly. If I’ve given the impression that Guyana is a place filled with “the mostest and the bestest,” it’s only because it’s true. This is Kaieteur Falls, the highest single-drop waterfall in the world, and a place to look for (and often to find, I’m told) Orange-breasted Falcon. These b-log entries have been a little jumbled, but a fuller and more coherent account of my trip in November 2007 will be published late this spring. And of course, keep an eye out at the WINGS website for an announcement of a new trip to this exciting South American destination! Take a fistful of fluff, add a wicked bill, endless patience, and an insatiable hunger for fat insects, and you’ve got a puffbird. Puffbirds, though in the same order as woodpeckers, are perhaps more similar to kingfishers in their big-headed and neckless appearance, but they tend to be quieter and more retiring than either most woodpeckers or most kingfishers, just sitting in the shade, waiting for a juicy morsel to blunder by. Guyana has a wonderful diversity of bucconids, and we had good experiences with most of them, from the flashy Black Nunbird, which we saw several times, to the subtly and intricately patterned Spotted Puffbird, encountered only in the damp woods at Surama. 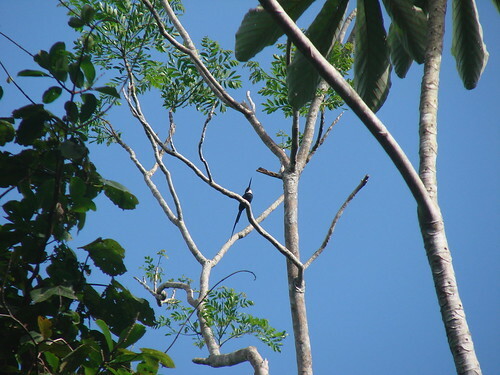 This is a Guianan Puffbird, distinguished from the White-necked Puffbird sensu novo strictoque by the restricted white on the forehead, just visible in this distant shot, and the somewhat smaller (!) bill than the great honking honker of White-necked. My favorite among the bucconids was the species we ran across most often; we could count on multiple sightings every day, usually of pairs perched and feeding together. 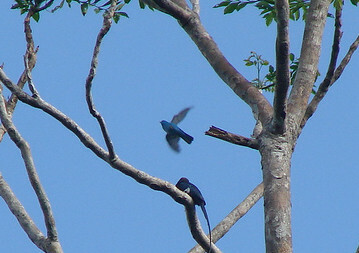 Swallow-winged Puffbirds were much more acrobatic and much more active than the other puffbirds we saw. They perch high in dead twigs, on the alert for passing insects, which they dart up to chase like pudgy swallows. In flight, they are unmistakable and odd, with rather short triangular wings and essentially no tail, reminding me of tiny Bateleurs in silhouette. There are many reasons to visit Guyana, but this funny bird is worth the trip all by itself.